On #GivingTuesday 2017, the Newtown Historic Association would like your donation to assist in maintaining the Thornton-Hicks House. This house is owned by the Newtown Historic Association and occupied by its previous owner and supporter of the organization. In 2002 we received a grant from the Pennsylvania Historical and Museum Commission to stabilize, repair and restore the roof, chimney, upper front wall and attic. The balance of the funds needed to complete this project were raised through generous community contributions. 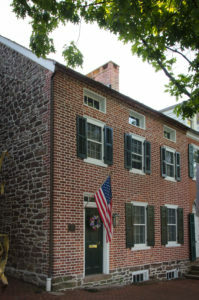 In 2014, the NHA was awarded a grant from the Bucks County Conference and Visitor’s Bureau to enable repointing of the North stone wall of the building. All of these efforts have maintained the building for the future. And now that the exterior structure of the building has been stabilized, our efforts are now focused on the interior of the building. The areas of immediate concern are ceiling replacements, plumbing upgrades and kitchen repairs. 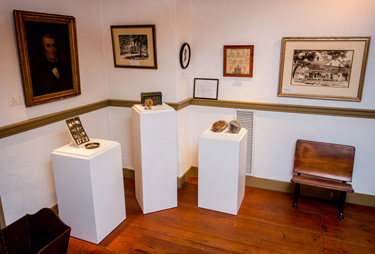 The Newtown Historic Association and the greater Newtown Community has a proud and unique history of stewardship for the Thornton-Hicks property. We hope that on this #GivingTuesday, you will help us to continue this tradition. Following Black Friday and Cyber Monday, #GivingTuesday is a global day of giving fueled by the power of social media and collaboration. This November 28th, please support the Newtown Historic Association with your generous, tax-deductable donation.